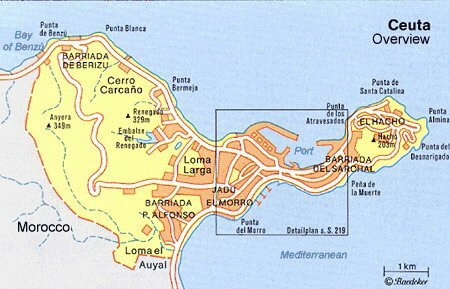 Ceuta is a little Spanish enclave in North Africa near Morocco. It's a peninsula about twenty kilometers long. When you arrive from Algeciras the first thing you see is the fortress on top of the hill. Spaniards have occupied the territory since 1640. At one time it belonged to the Portuguese. The castle was built in that period. We stayed in a pension in the middle of the charming little town, many people spoke Spanish. We could see the Iberian-African mixed in the population. Many people are from Rif Berbier ancestry. We shared the pension with two other girls from Edmonton, Marcia and Grace . A small patio separated our rooms. We walked downtown, where there was some orange trees in a park .The oranges were quite sour. Later on we went to Tanger on the Moroccan coast.